When we bought our house this summer, we converted one of the three bedrooms into a home office. It’s been a slow process, I still haven’t finished my Pottery Barn inspired desk (there’s been an unfortunate painting incident I will explain in a later post) but the storage situation was out of control. I knew that I had to put all other projects on hold so I could get this mess out of control. Seriously. Take a gander at the “situation” we have going on here. Please excuse the bad lighting. The office sadly does not get any direct sunlight. The knobs came with the house. They had two little girls in this room. Needless to say I was not sad to see them go. Oh, you mean you wanted to see the INSIDE of this train wreck? Well…uh…ok fine. Ugh. Yeah, it’s not a pretty picture. Things kind of got out of hand. You see, there’s a bench under all the crap. That was built (rather crappily might I add) by the previous owners. Their daughters used it as a bench. In their closet. Why? I have no idea. And of course, the crappy wire shelf goes great with the crappy bench seat. Of course the wire shelf has a bar for hangers, but since this is our office, we have zero need for hangers. So what’s a girl to do? Rip it all out of course! Whew. That looks better already. I decided to leave the wood bracket for the bench in the closet. One less thing to rip out, plus its the exact same set up being used for the shelf brackets. Don’t make things harder than you have to, folks! Its a little wider than the brackets I am using, but since its on the bottom, you won’t see it. Here’s an in-progress shot of the shelf brackets. I used 1 x 2 furring strips to make the shelf brackets. They are super cheap, but you have to make sure that you find the straightest ones possible. Because they are so inexpensive, there’s a lot that are warped and curved. You need straight shelf brackets unless you want crooked shelves! One other tip, make sure you use a stud finder to make sure you’re attaching the bracket to the wall via a stud. 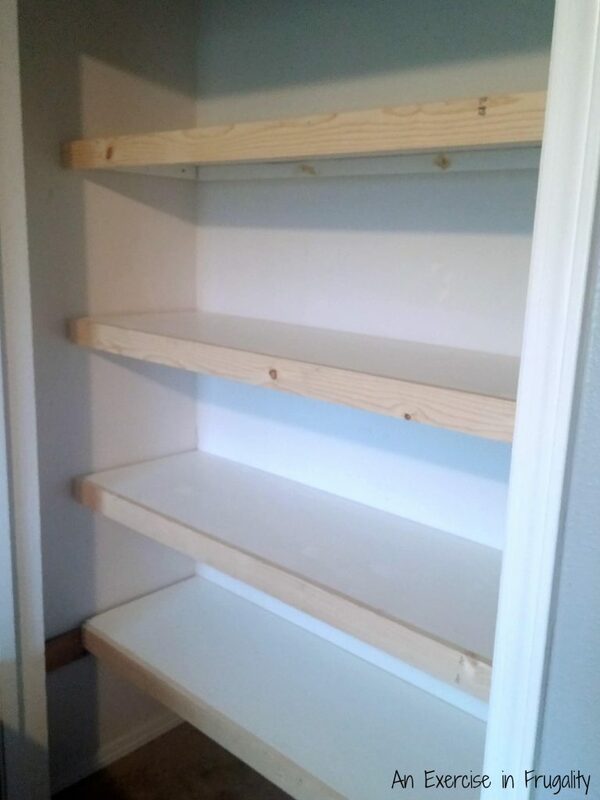 Otherwise your shelves are just mounted to the drywall, and that is a recipe for disaster, especially if your shelves are going to hold heavy items. I used screws to attach the brackets to the studs. You may opt to use wood putty to cover the screws, as they may be visible once the shelves are in place. You’ll notice that the brackets were painted before attaching them. I also painted the shelves. It’s easier to paint them before you put it together. Make sure you use a level to make sure everything is..well, level. I attached the back bracket and one side before adding the shelves themselves. Then just add the third bracket to the last side once the shelf is in place. Once I laid the shelves down and attached the final bracket, I used finishing nails to attach 1 x 3 strips as a molding. It makes the floating shelves look more “finished” and covers up the brackets. They look weird now, but once they’re painted they will look better. 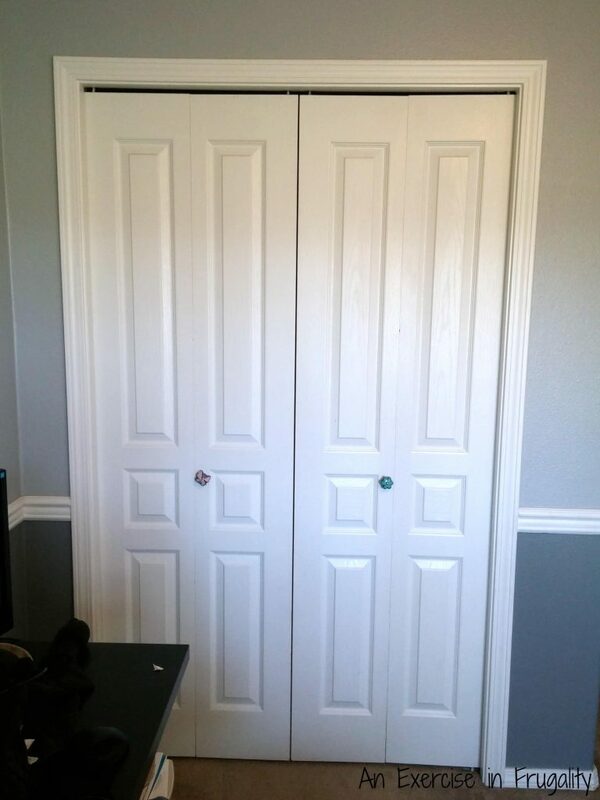 You can paint after, but then you will have to go back and touch up to cover the finishing nail heads. This is the finished shelves before painting the molding from a different angle. If you really want you can seal the “cracks” between the shelves and the wall with caulk. I didn’t bother, because frankly it’s a closet and if anyone is that far back in my closet inspecting, they can caulk it themselves. 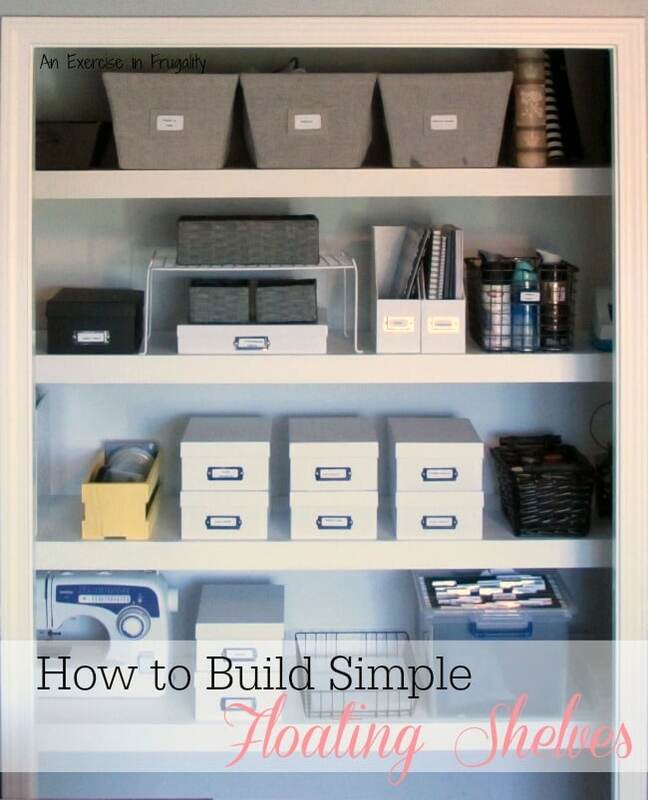 I also recommend reinforcing the shelving underneath with extra 1 x 2’s but this step is optional. Here we have the finished product! All done. These floating shelves are sturdy, functional and really pretty! 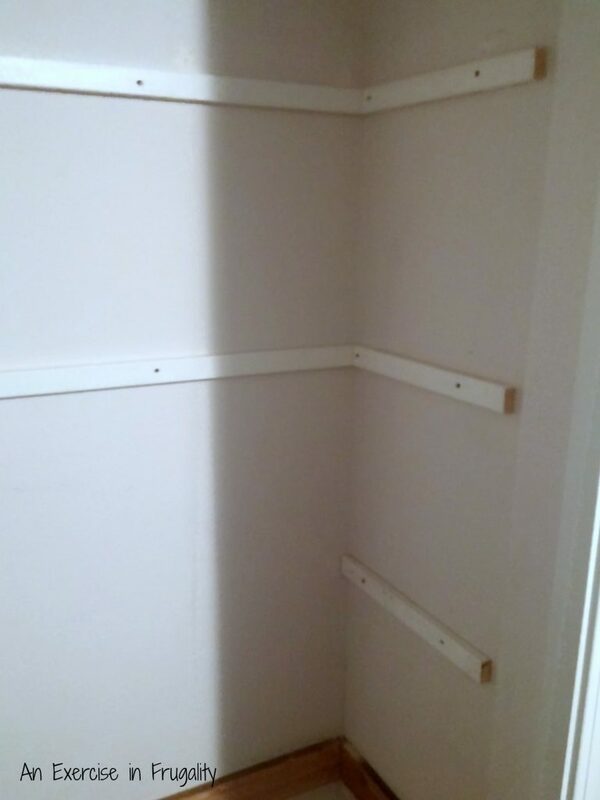 They were so easy to do, the hardest part is holding up the shelving and brackets level while you screw them in. I highly suggest a helper for that part, unless you want sore arms. If you want to make the shelves pop, you can paint the walls a fun color, or paint the shelves a fun color…or both! For the organizational items, I used mostly things I had around the house. The exception being I did pick up some more of the white boxes from Michael’s. They have them on sale on occasion for $2.00 or less so I snatched up a bunch. They stack perfectly and I love that they are all labeled with all my random supplies. 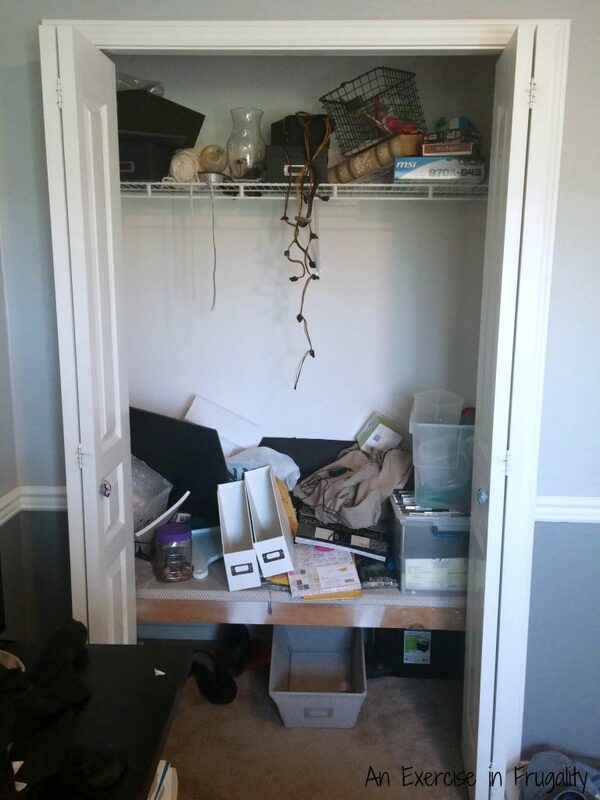 I have everything from makeup to art supplies to office supplies in this closet and its all so neat and organized! Another tip I would love to pass along: Make sure you take into account the height of your top shelf relative to the top of the door frame. If you make it too small, you won’t be able to get any items onto or off of the top shelf. No point in having floating shelves that aren’t functional! Let’s be real here. The before was horrendous. The after? Practically perfect. I took the doors off while I was building the floating shelves with the intention of putting them back on, but honestly, the floating shelves turned out so purdy I think I might just leave them off. Maybe a fun-patterned pair of curtains instead? I’ll see how I feel once I live with it for a few weeks! So what do you think? The whole project cost less than $70. You could probably pull it off even cheaper if you don’t require as deep of shelves as I used. And it only took a few hours to build. Easy peasy. That came out great. I love the idea of this. 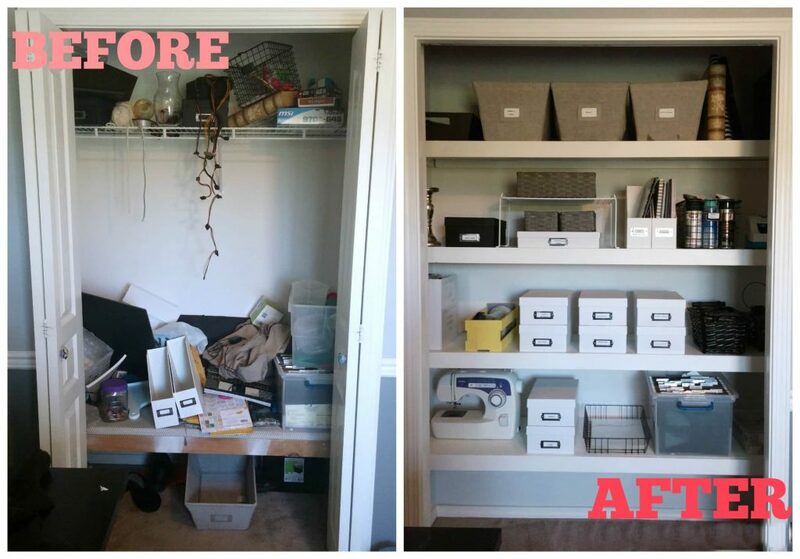 Love it, the before looks like our office closet with all of my husbands computer crap LOL Oh man, I need to make these and pronto!! That is a perfect use for that space. 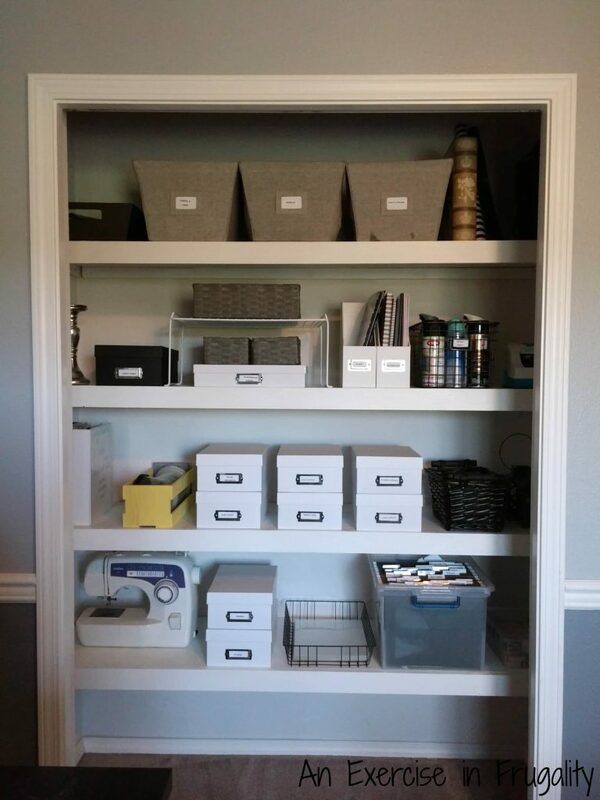 You look so organized I know the closet I would love to to that in…. Wow those look so good. i need hubby to read this so he can build me some. Wow! What an amazing makeover? I’d love to do this to our closet in the office but we’re renting and I don’t want to go through all of that fabulous work just to have to take down again. What a great transformation! It looks awesome! Great job! Fantastic! I think I could actually pull that off! I have too many projects in the works now, but this is something to put on the “right before spring” list! It turned out great! Way an awesome way to maximum the space! Definitely an improvement! I want to make these for these tiny spaces in my house. Wow, what a great idea. This looks so nice and fresh. This is a project I needed to see right now. 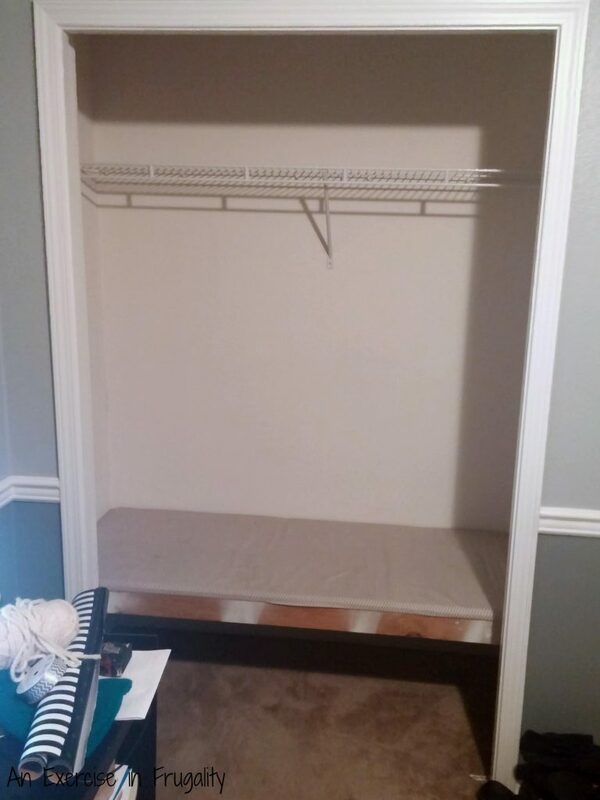 We are working on using our space better in an older home – and the closets are not as deep as in modern homes. 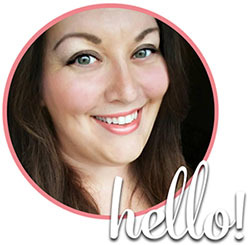 We really don’t use them for clothes that we wear daily – this is perfect! Beautifully done, Rose. 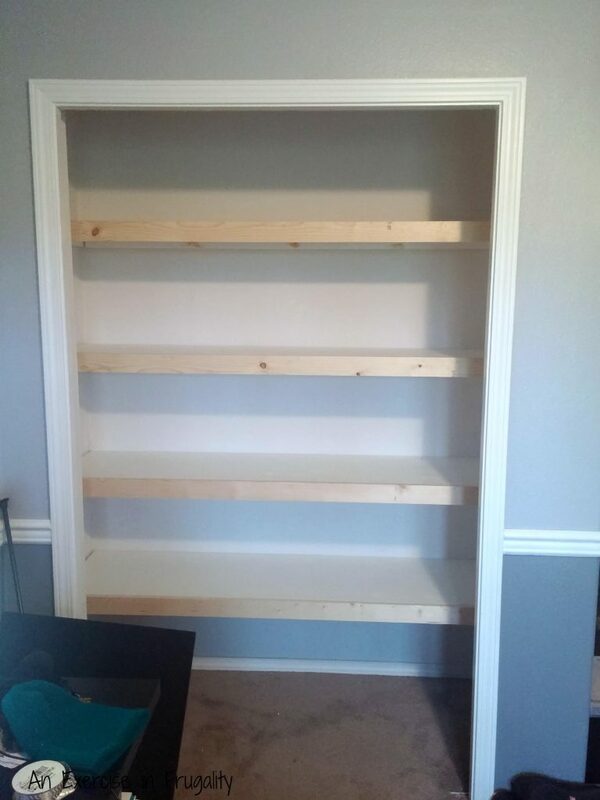 How did you get the shelf boards past the frame? 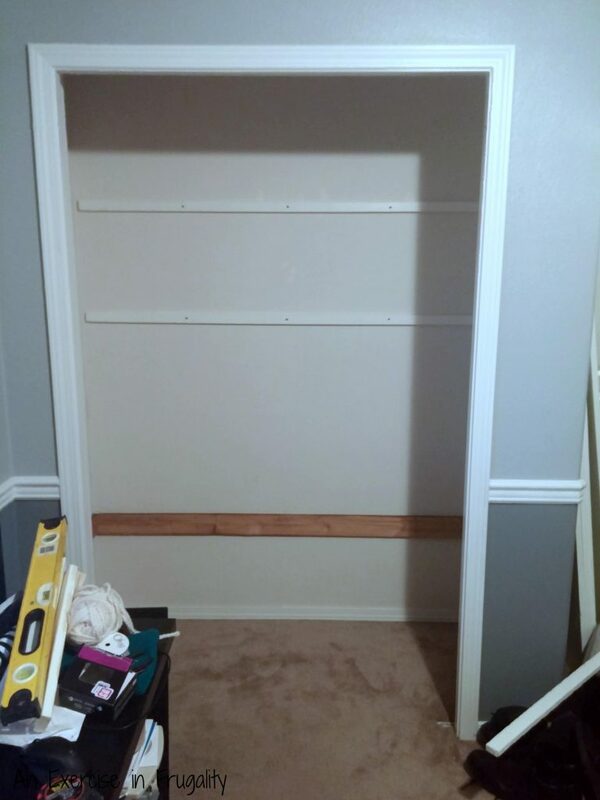 It appears that we have the same style closet; the interior is six feet across, but the exterior frame is narrower by several inches. 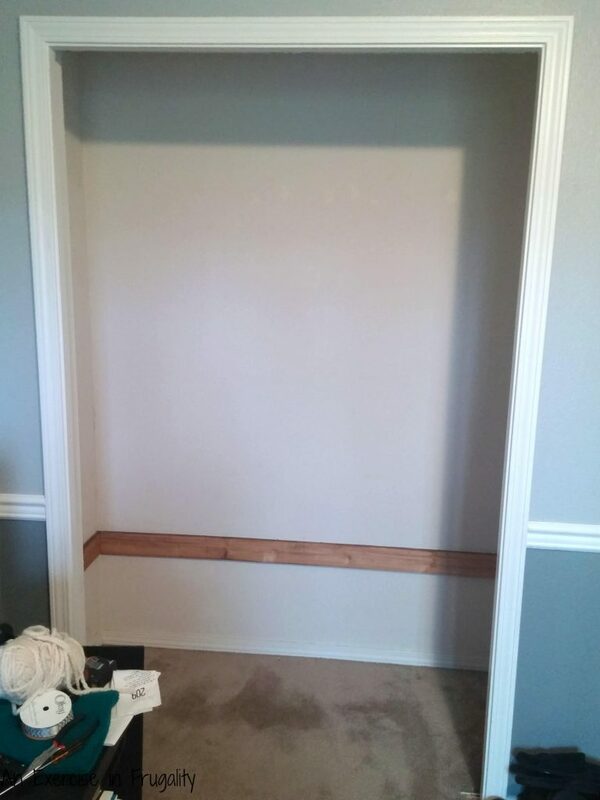 Is the exterior frame to your closet also six feet? 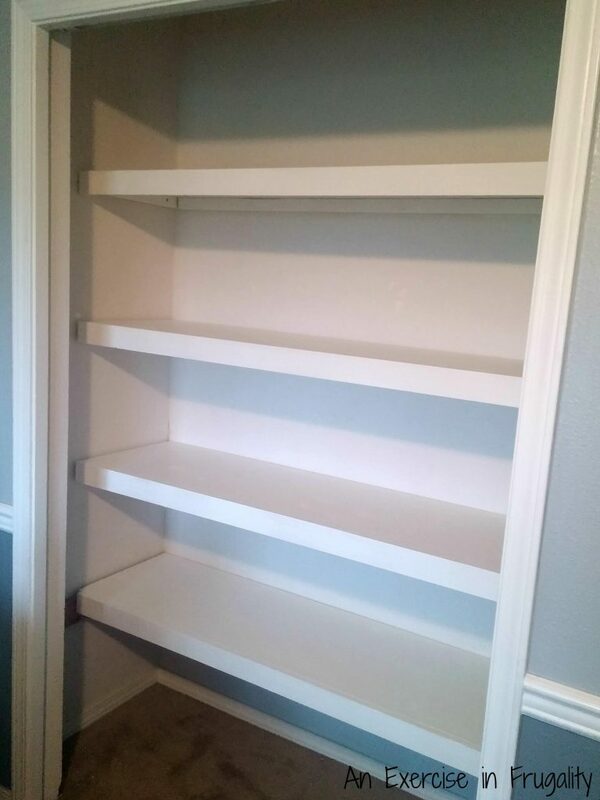 If not, do you have any tips on how to fit the shelves in? Many thanks. Why do you put the back and one side “bracket” up but not the other side til after you put the shelf up. I’m really wanting to do this but can’t seem to wrap my head around that concept. Your’s are fantastic!